Not using the food processor means that you are less likely to cook with vegetables because it is more work. And while most recipes on this site that call for a food processor can be made easily without one, the vegetables may come out less fine and some kids will object. In this recipe, vegetables are chopped or sliced coarsely by hand. I like to make this to use up the last of the vegetables when I am ready to buy fresh produce. First, set up some rice to cook. Bring one cup rice, 1-3/4 cups water, a teaspoon salt if you like to a boil. Lower the heat, cover, and cook for 17 minutes. For brown rice, increase water to two cups and cook for 30 minutes. Protein options: 1 can cooked beans or chickpeas, 1 can tuna with water, or a cup of cooked meat cut in chunks. Seasoning: 1-2 tablespoonsTamari or soy sauce and ginger, or hot pepper. Peel vegetables as required and remove seeds. Cut into bite size slices or chunks. Onions and potatoes can be cut into 8-10 slices each as they will get soft. Slice zucchini into one-inch coins. Heat oil in a heavy frying pan or wok. 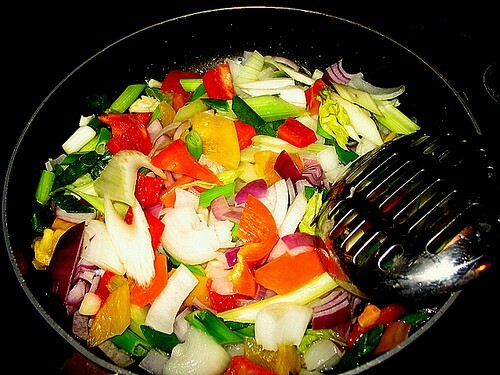 Start with the onions, peppers, carrots, and celery and stir with a wooden spoon. After the onions are starting to get soft add the zucchini, cabbage, leafy greens, or broccoli. Heat and cover for a few minutes. Avoid overcooking, the vegetables can be slightly firm. Add beans, flaked tuna, or meat. Cover and cook just until everything is hot all the way through. Add tamari or soy sauce, ginger, or hot pepper or hot sauce if you like. You may need additional water; you want there to be some sauce for the rice to absorb. Serve over the rice, that should now be cooked. When I was growing up my mother topped this with “La Choy” Chinese noodles from a can. Sounds delicious. Too bad my kids won’t eat it – they don’t like tuna nor all those vegetables mixed together. But I would eat it, especially with beans instead of tuna. I guess the leftovers can be eaten cold the next day. I’m with Leora. But that goes for just about anything healthy I cook. Hannah, how do you start to cook healthy for kids who are used to home-cooked fast food (pasta, burgers, shnitzel/potatoes)? It’s discouraging because sometimes the best meals* are the least eaten. By best meals I mean the ones I plan. The well-rounded, healthiest, most diverse ingredients. These are the meals that are most likely to be mostly thrown out. It’s very discouraging as my available time for cooking is very short. Not using the food processor means I am MORE likely to cook with vegetables. If I need veggies for a stir fry or a salad it’s so much easier to quickly cut them up with my favorite knife than get out the processor, find the right blade, wash it up afterwards…..
Looks good and yummy and my children will love it. Here’s how to make this even faster. Add some frozen vegetables (corn, peas, bean sprouts). Defrost before adding to the stir-fry. Watch out for baby carrots, though. I heard they are bleached. Thanks Leah, I love variations. For variation (and a little more time), I have made the above and then put it inside rolled out puff pastry dough which I then fold over and close like a calzone and bake it for 15-20 minutes. My kids love it this way and it is more filling. Elisheva, sorry I missed this comment before. I like your idea!